He studied singing at the Conservatoire National in Paris under Isnardon. In 1906 he was engaged by Albert Carré for appearances at the Opéra-Comique in Paris. Here he made his debut in the same year as comprimario in G. Charpentier’s ‘’Louise’’. He appeared with great success many years at the Opéra-Comique as principal bass. 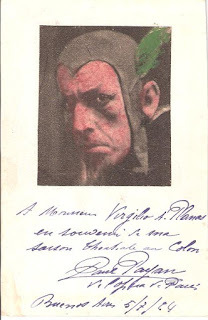 Payan participated also in several opera premieres: ‘’La Habanéra’’ of Raoul Laparra (26. 2. 1908), ‘’Macbeth’’ of Ernest Bloch (30. 11. 1910), ‘’La Lépreuse’’of Sylvio Lazzari (7. 2. 1912), ‘’La Danseuse de Pompéi’’ of Jean Nouguès (29. 10. 1912) and ‘’Marouf’’ of Henri Rabaud (15. 5. 1914). Later he joined to the Paris Grand Opéra and became known in the French province by numerous guest performances. In the 1921-1922 season he became a member of the Chicago Opera, where he had a huge success in ‘’Le jongleur de Notre Dame’’, ‘’Manon’’, ‘’Roméo et Juliette’’ and in ‘’Samson et Dalila’’. In 1924 he was engaged by the Teatro Colón in Buenos Aires. In 1928 he sang at Covent Garden the following parts: Zuniga in ‘’Carmen’’, an old Hebrew in ‘’Samson et Dalila’’ and in ‘’Louise’’. Nevertheless, center of his artistic work remained Paris, where he was active later also as pedagogue. He may not be mistaken with French baritone Paul Payen (1900-1982).